Landon Cassill picked up the 10th last-place finish of his Monster Energy NASCAR Cup Series career in Saturday’s Federated Auto Parts 400 at the Richmond Raceway when his #34 CSX “Play It Safe” Ford was involved in a single-car accident after 33 of 404 laps. 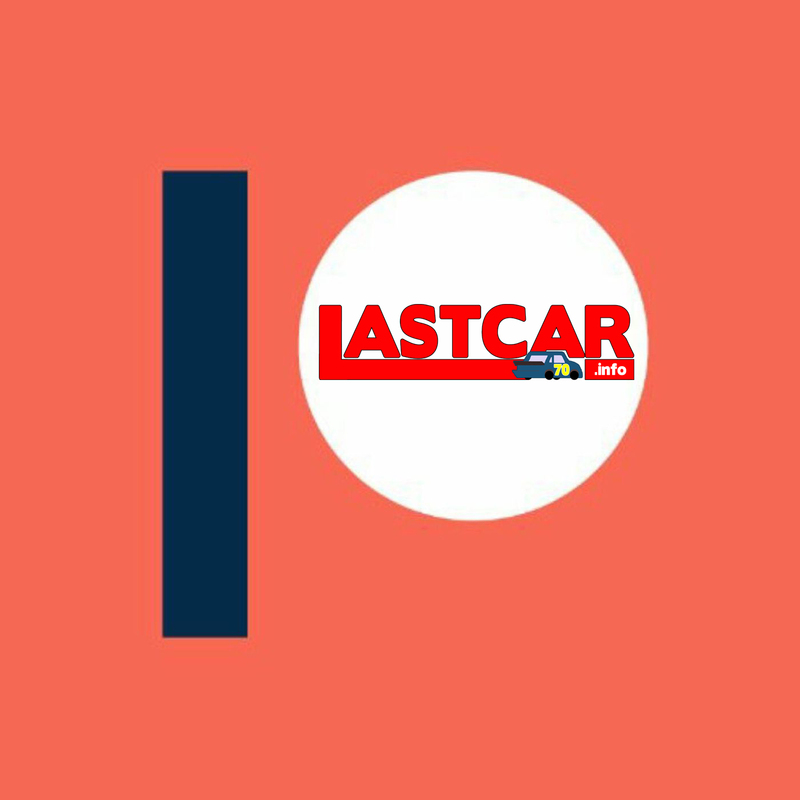 The finish, which came in Cassill’s 249th start, was his first of the season and his first since October 18, 2015, during the Hollywood Casino 400 at Kansas, 67 races ago. Saturday’s last-place finish was also the first for Cassill since he joined Front Row Motorsports in 2016. 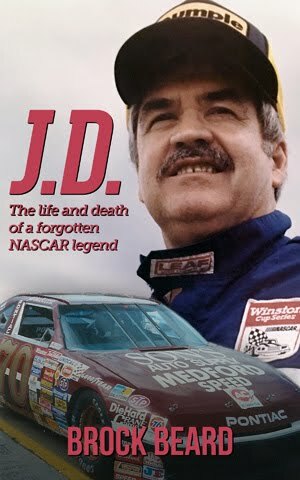 The popular driver enjoyed his best Cup season to date that year, leading 20 laps at Bristol, finishing a season-best 11th at Talladega, and running a tribute to J.D. McDuffie at Darlington that involved both Ima Jean McDuffie as well as sponsors Rumple Furniture and Bailey Excavating. 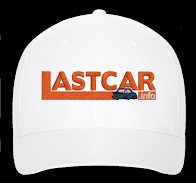 He also continued to grow his fanbase on social media with the “38, nice” campaign, and finished 29th in points, outranking fellow full-timers Brian Scott and David Ragan. 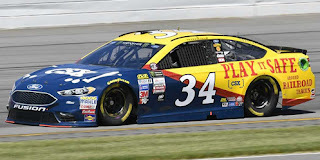 With Ragan now as his teammate, Front Row switched Cassill to the #34 Ford this season. There, his performance has been down as he’s finished no better than a 16th in the Daytona 500. He had four DNFs coming into Richmond, including a controversial one at Indianapolis where NASCAR mistakenly parked him for stopping in pit road under a late red flag. Just last week at Darlington, where he ran Chris Buescher’s throwback from a year before, Cassill was run over by a hard-charging Denny Hamlin in the final laps, but still managed to come home 21st. 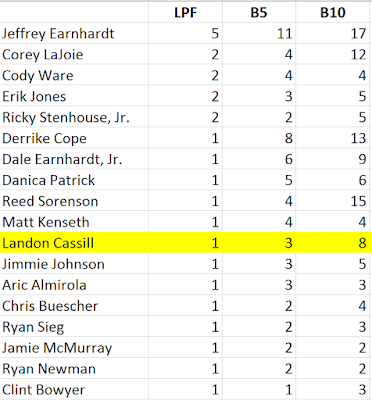 Coming into Richmond, Cassill sat just 32nd in the series standings, still looking for both a first career victory and his first Top 5 since 2014. His was one of the 39 cars entered in Saturday’s race, just one driver more than the record-setting 38-car field there in the spring. Right away, the #34 showed solid speed. He began the weekend 18th in Friday’s opening practice and 20th in Happy Hour, but fell short in qualifying. His timed lap of 121.359mph was good enough for only 30th on the grid. Starting last was B.J. McLeod, who on Friday was revealed to be back behind the wheel of Rick Ware Racing’s #51 Chevrolet for the fifth time this year and the first time since Bristol. For the second-straight race, the Ware entry carried a message of solidarity for the victims of Hurricane Harvey, this time with the phrase “Texas Strong” over the car’s hood and quarter-panels. When the green flag dropped, McLeod raced door to door with Derrike Cope, who was making his first Richmond start in Cup since 2006. At the end of the first lap, Cope’s #15 StarCom Fiber Chevrolet took the spot, 5.118 seconds behind the leader. Cope was 8.605 behind by Lap 4 and 13.114 back by the eighth circuit. On Lap 12, McLeod, struggling with a car tight in the center and loose off, retook last from Cope and was the first to be lapped on the 19th time by. Had the order stayed the same, McLeod would earn the first last-place finish for the #51 in a Cup race at Richmond since February 24, 1985, when Cecil Gordon drove for Greg Sacks before steering issues stopped him 7 laps in. McLeod was still running last when the first caution fell for Cassill. Finishing 38th that night was, surprisingly, Matt Kenseth, who was involved in one of the night’s most controversial incidents. Under caution on Lap 258, pit road was opened as an ambulance slowed, then stopped at the entrance. This forced cars to swerve and dart in all directions to avoid running into the ambulance, or each other. Unable to slow in time, Kenseth rear-ended fellow “win and you’re in” driver Clint Bowyer, destroying the front valence of his #20 Hurrricane Harvey Relief / ToyotaCare Toyota and rupturing the radiator. 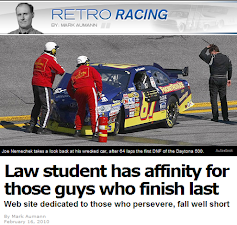 Behind McLeod, who wound up 37th with late-race transmission issues, was Derrike Cope, who found himself amid controversy after he inadvertently played a critical role in the race’s final moments. As the race neared the finish, Cope’s #15 slowed and ran the high line to avoid oncoming traffic. With just three laps to go, following a grinding 135-lap green-flag run, Cope made contact with the wall in Turn 4. As Cope slowed to make it to pit road, the caution was thrown, forcing a frantic series of last-minute pit stops which ultimately handed the win from Martin Truex, Jr., who was cruising to a three-second win, to Kyle Larson. Rounding out the Bottom Five was the #23 SweetFrog Toyota of Gray Gaulding, his second-straight finish of 35th or worse in his return to BK Racing. 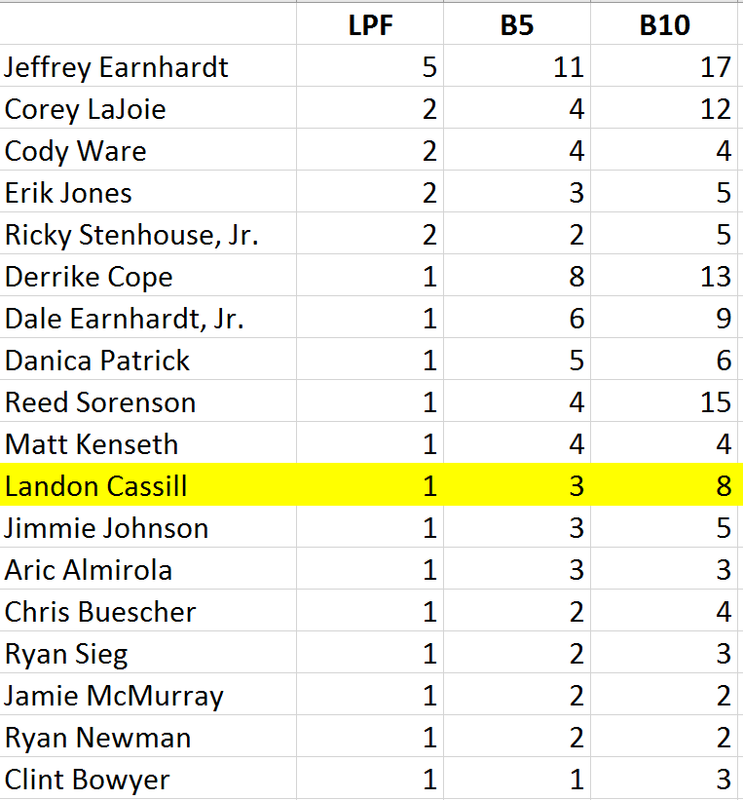 *This marked the first last-place finish for Cassill and car #34 in a Cup Series race at Richmond.